The action of the DreamLeague Major 2019 now boils over to the Annexet Arena in Stockholm as the six remaining Dota 2 teams will be playing in front of the live audience for the $1 million prize pool and 15,000 DPC points along with it. To say that the tournament has turned out in a way that nobody expected it would is only fitting. After all, Team Liquid, who we billed as our pick to win it all, made an early exit and couldn’t even make it past the first round of the lower brackets. Meanwhile, another heavy favourite, Evil Geniuses, is already out of the tournament. Finally, both Team Secret and Virtus.Pro will be eliminating each other way earlier than expected, and that’s if they don’t end up getting eliminated before then. With that said, the first two matches that the live audience will get to see will be between upper bracket teams, Vici Gaming and PSG.LGD, as well as Fnatic and Keen Gaming. We’re going to be focusing on the former below. Being that both are Chinese Dota 2 teams, Vici Gaming and PSG.LGD have met each other quite a few times already this season. In fact, Vici Gaming have squared off against PSG.LGD five times in a LAN tournament this year. Of those five times, PSG.LGD have gotten the better of them three times. But, nearly every game was tightly contested, which suggests that these two teams are definitely neck-and-neck as far as skill level and talent goes. In terms of experience, we normally would’ve given it to PSG.LGD. However, the current lineup is incomplete. Lu “Maybe” Yao is out and in his place is Guo “Xm” Hongchen, who, despite having proven himself a capable player, is just not the same type of player that Maybe was, who could take over games and be a win condition in on himself. The stylistic difference between the two mid players have forced PSG.LGD to rely more on Wang “Ame” Chunyu and he has definitely responded. With an 11.42 KDA in 7 games, Ame leads all performers at the DreamLeague Major 2019. Not to mention, PSG.LGD leads all teams with most average kills and assists per game (30.29 average kills per game and 66.14 assists per game), which bodes well for a meta that heavily favours teams who run “kill lanes” — a strategy which emphasizes maximum kill potential during the laning phase. But, while the stats may favour PSG.LGD, the eye test shows that took a relatively easy route to get here. Matched up against the likes of Infamous, Ninjas in Pyjamas, and Mineski, all of which have already been eliminated, PSG.LGD gorged on the opportunity presented at them. Meanwhile, Vici Gaming had to face off against relatively better competition, including Team Secret, who they outdrafted and outplayed in their best-of-three series in the opening rounds of the upper bracket portion of the playoffs of the DreamLeague Major 2019. While the odds do slightly favour PSG.LGD, anyone who’s been following the tournament closely know that these two teams are evenly matched and expecting anything less than a close series will be foolish. In terms of draft and versatility, however, we’re going to have to give the edge to Vici Gaming. Vici Gaming have had a chance to play against various teams after a near-flawless run at the StarLadder ImbaTV Dota 2 Minor and so far, have proven themselves capable of playing various. On the other hand, PSG.LGD seem intent on sticking to playing 4-protect-1 with Ame, which has worked so well so far, but they haven’t faced off against a team of Vici Gaming’s caliber yet this tournament. Also, with Maybe out and Xm in, PSG.LGD doesn’t have that rock that they’ve consistently relied on in the past. This could prove to be a determining factor when push comes to shove, and things are definitely going to get chippy when PSG.LGD clashes with Vici Gaming. Vici Gaming proved a lot of their doubters wrong with their big win against Team Secret, and there’s little doubt that they’re just raring to prove that they can actually win a big LAN event after coming so close many times before over the past two years. 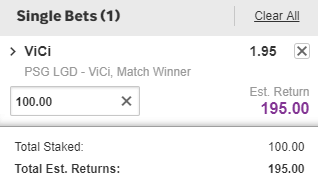 With that said, our money’s on Vici Gaming winning their matchup against PSG.LGD to guarantee themselves a top-three spot at the DreamLeague Major 2019.